It’s the biggest night of the year, so make it one to remember by counting down to 2019 at the most sensational celebration in the capital! Step inside our crisp winter wonderland, as we transport you 3,500 miles across the pond to a sparklingly festive experience in the ‘Big Apple’. Marvel at the dizzy heights of the Rockefeller tree, as skaters wrapped up in scarves and hats zip to and fro and street vendors warm their hands over charcoal braziers. Dust the snow off your coat and step into the warmth of a smart Manhattan lobby, ascend on to the mezzanine and rub shoulders with New York’s elite in the plush Manhattan bars whilst you sip ice cold cocktails and eat sumptuous canapés overlooking the splendour of Central Park. 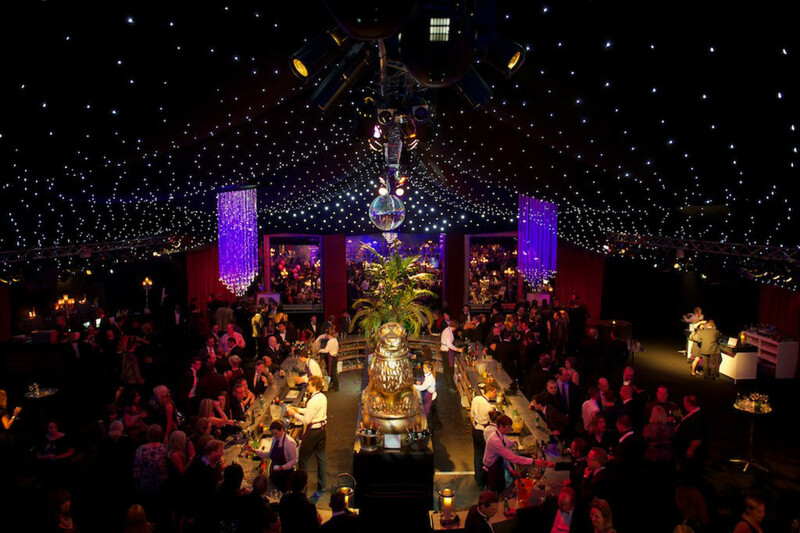 Join us at Battersea Evolution, set in stunning Battersea Park, for a sensational night of incredible food, mesmerising live entertainment and an electric atmosphere. If you haven’t experienced one of our sell-out New Year’s parties before, we guarantee you will be amazed. Last year’s event theme was ‘New York, New York’ which means you got the chance to celebrate 2 iconic cities in 1 night. Featuring plush Manhattan bar’s, street food canapes and a dazzling show on Broadway. You dined surrounded by the bright lights of Broadway and enjoyed live streaming of the London fireworks at midnight. Battersea Evolution is located only 1 mile from London Victoria and we will be laying on a shuttlebus service back to the station at the end of the evening. If you haven’t experienced one of our sell-out New Year’s parties before, take a look at this page to find out what to expect on the night. Our tables seat between 8-12 people. Larger groups are accommodated over more than one table, you will always be seated with people from your party. We have a limited number of tables to seat groups of 14 which are allocated on request.